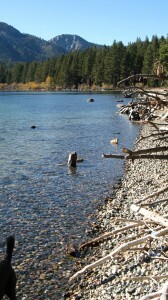 From South Lake Tahoe’s “Y” intersection, take Highway 89 towards Emerald Bay. 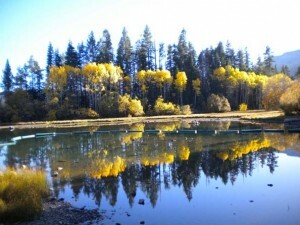 Drive three miles north, through Camp Richardson Resort, and shortly after, turn left onto Fallen Leaf Lake Road, which is across from the entrance to the Tallac Historic Site. Continue for about 0.8 mile, pass the entrance to Fallen Leaf Lake Campground, and 0.25 miles ahead, after the road curves right, there are small parking areas on both sides of the road. The trailhead is located on the right-side (west side) of the road. At the 0.2-mile mark the trail forks. 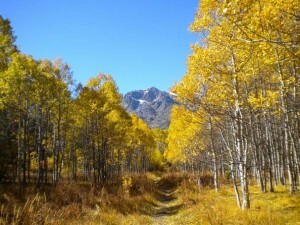 Veer left onto a wider, gravely trail that skirts a large meadow, clasping Aspens whose autumn yellow hues are especially postcard picturesque in October. 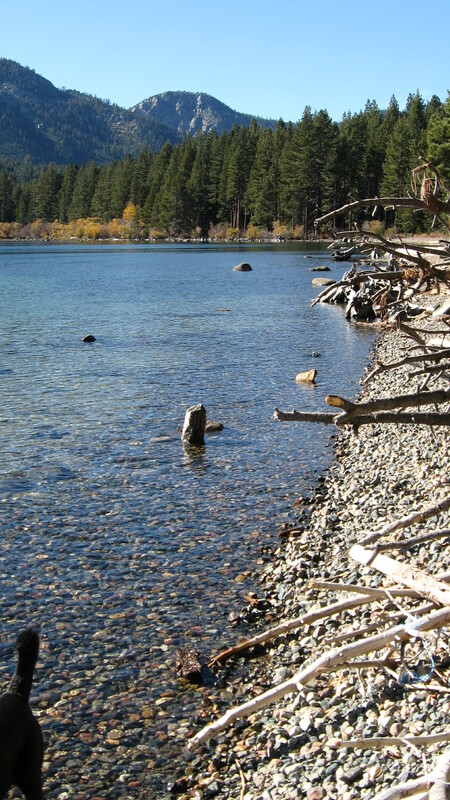 This trail rambles onward towards the crystal clear waters of Fallen Leaf Lake, located at the base of Mount Tallac. 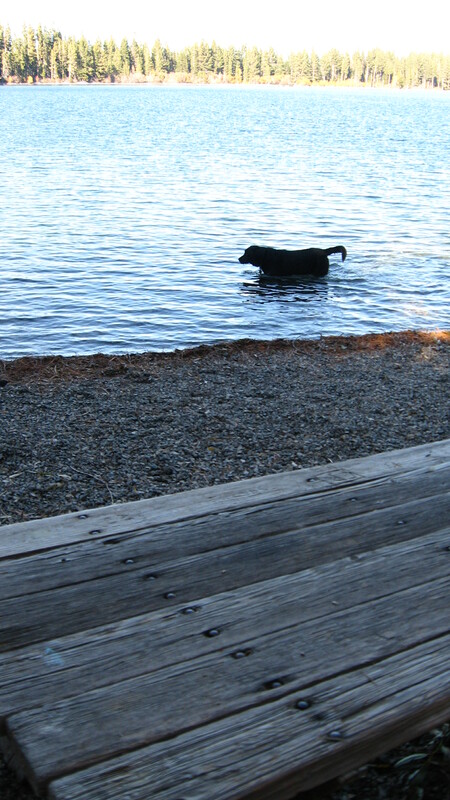 If you packed a swimsuit, take left-hand spur trails to the water’s edge for a quick dip. For shorter loops, take right-hand spurs back to Fallen Leaf Lake Campground. 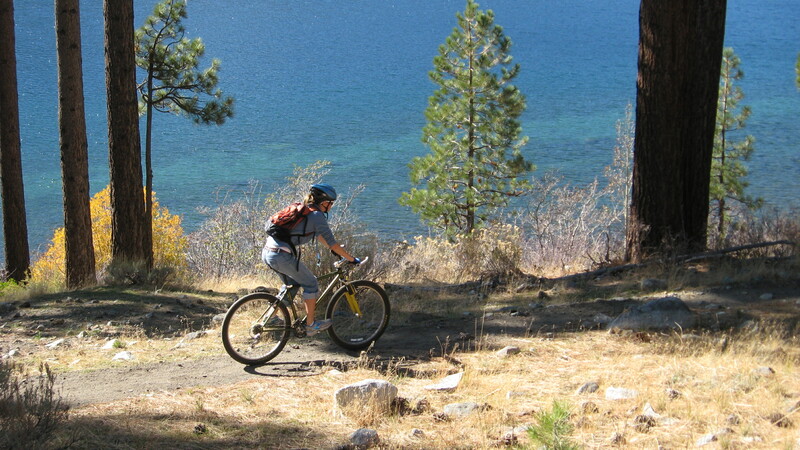 Otherwise, continue leisurely counterclockwise on this mellow, shoreline singletrack, profiting from what locals consider some of the most beautiful scenery in South Lake Tahoe. Ride straight through the intersection of trails and cross a narrow spillway, where, in October, pedestrians might be parked for viewing rainbow-colored, spawning Kokanee salmon in the waters close to the outlet. On the other side of the spillway, pedal to a T intersection and turn left for a short stint to yet another fork in the trail. 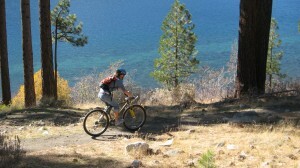 A right-hand turn will steer you in the direction of Taylor Creek and Cathedral trail. Veer left, towards Fallen Leaf Lake, for the Sawmill Cove Loop. After a short, rewarding climb, an inviting picnic table is visible on Sawmill Cove. This perfect lunch stop offers views of Fallen Leaf Lake’s opposite shoreline, on which, just a short time ago, you were peacefully navigating by bike. At the Sawmill Cove junction of trails, veer right onto a dirt road, pass an old foundation on the left, and swerve right around an isolated, log cabin onto a doubletrack which soon shrinks into singletrack. Turn right at another T intersection onto a wider trail and veer left at the fork, completing the Sawmill Cove Loop. Continue straight onto Cathedral trail, which channels its way through dense pine and aspen, between Taylor Creek, another popular Kokanee salmon vista spot, and Cathedral Road. Follow the blue diamond markers for this winter cross-country ski route of the Taylor Creek Sno-Park to its bleed-out point onto Cathedral Road, close to the intersection of Highway 89. Now it’s pavement all the way back to the car! Take the Camp Richardson Bike Path, which parallels Highway 89, for a quarter-mile, to the Fallen Leaf Lake Road turn-off on the right. Follow Fallen Leaf Lake Road up the trailhead to complete the 4.9-mile loop.